Going into the game against Tennessee, most of Cleveland figured the Browns had an easy win. The Titans quickly put an end to those thoughts. Tennessee broke ahead to 28-10 at half. The defensive in the first half looked horrible. Missing tackles left and right, letting Jake Locker run all over the field. Even when Jake Locker went out with an injured thumb, the defense continued to disappoint. Charlie Whitehurst came in the game and threw a touchdown pass to Kendall Wright. After that Browns found their self down 21-3. After that the Browns failed to get anything done on offense. Charlie Whitehurst came out and threw deep bomb to Justin Hunter for a 75 yard touchdown. As a Browns fan at this point, I thought we hit rock bottom and the game was over. With the last drive in the first half Brian Hoyer led the Browns on a 9 play, 80 yard drive. So at half time the score was 28-10. This drive was huge, it really set things up for the second half. Mike Pettine must be a really good motivational speaker.He really got his guys fired up. In the third quarter the Browns marched 56 yards down the field. Although this drive didn’t result in 7 points, the Browns were able to put up 3 points. Penalties played a big role in this Cleveland Browns Victory. Travis Benjamin muffed a punt that Tennessee recovered, this would have been the first turnover of the season for the Browns. After looking at the play again, the refs saw a Titan run out-of-bounds and make no attempt to get back in. This resulted in a re-punt. Since the muffed punt got called back, the Browns still remained the only team without a turnover this season. Unfortunately later in the game Brian Hoyer threw an interception that was nearly returned for a touchdown. Good thing for Browns fans is illegal contact passed five yards, and a small fight broke out on the field. This resulted in a replay of down. After all this went down, it was now the fourth quarter with the Titans still leading. With Cleveland’s defense finally getting things back together they held Tennessee to a 3 and out inside their own 15. Tank Carder of the Cleveland Browns got through the offensive line and blocked Brett Kern’s punt. The ball bounced to the back of the endzone, this resulted in a safety. It was now a smaller gap, 28-15 Titans. On the drive after the safety the Browns marched the ball down the field once again. Brian Hoyer connected with Travis Benjamin for a 17 yard touchdown pass. This pass from Hoyer was a great pass. It came on a play action, Hoyer was being blitzed, he then put the juke moves on the Titans player, then threw the ball to Benjamin for the score. As a Browns fan I was feeling on top of the world after that touchdown. My feelings dropped after Brian Hoyer threw his first interception of the season. This interception came from a pass intended to Andrew Hawkins, Michael Griffin ended up with the ball. The Titans now have the ball with 5:05 left on the clock. My heart was broken after that interception. I realized that we let yet another game slip away. Boy, was I wrong! It was 3&6 with 3:12 left, Charlie Whitehurst hits Delanie Walker for a 4 1/2 yard gain. The refs initially called this a first down, Mike Pettine threw out the red flag, and it was called back a yard and a half. It was now 4th and inches, Tennessee decides to go for it. They call a QB sneak, Whitehurst was stopped by the Browns defense. Browns ball, 3:03 left in the fourth quarter, Browns down 6. This drive started at the Titans’ 42 yard line. With help from Ben Tate, Brian Hoyer manages to get ball to the four yard line. At this point there is a minute 15 on the clock. Hoyer gets the snap, and finds Travis Benjamin for the six yard touchdown grab. 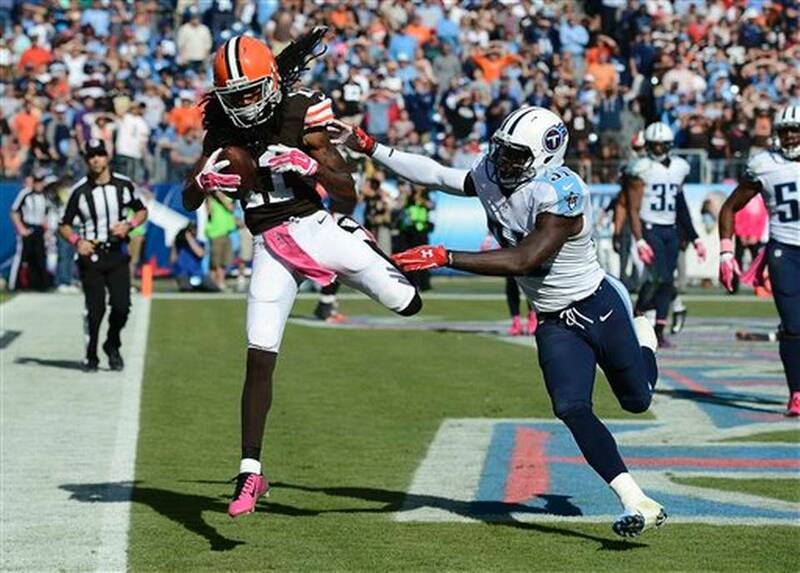 After the near muffed punt, Travis Benjamin really got things back on track catching two touchdowns. 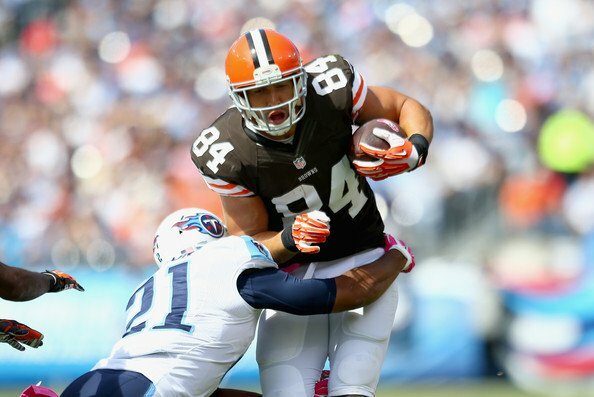 These two touchdowns help the Browns reach the victory over the Tennessee Titans. This 25 point comeback is the biggest comeback from a team on the road in NFL history.